Microsoft’s CEO Satya Nadella released his FY15 employee memo today. His message to employees: Be Bolder, More Ambitious and More Innovative. Microsoft at its core has always been a software platform company that dabbles into direct consumer and/or business experiences. Windows, Office, Developer Tools, Cloud, etc. are all enablers to some other person or company creating a solution that impacts a customer. Azure is a platform that only sings when lots of businesses use it to create business solutions, empower their customers and innovate. Interestingly, one of the few direct consumer experience brands, XBOX, gets special mention. There are has been some media speculation that Microsoft might sell off XBOX but in his memo, Nadella positions XBOX has another key platform and one in particular that is driving innovation by pushing the boundaries of cloud, mobile, interactive experience, massive networking, etc. How Do We Leverage this “Productivity Platform”? What do we mean by “productivity” in this new era? It means harnessing these new platforms to create massively disruptive businesses that engage customers in a different way than traditional businesses. Thoughtworks published an interesting article and keynote video that describes how the integration of Big Data, Ubiquitous Touch and Cloud create a radically different platform than the web and traditional IT stack of ten years ago, leading to new ways to create customer engagement. 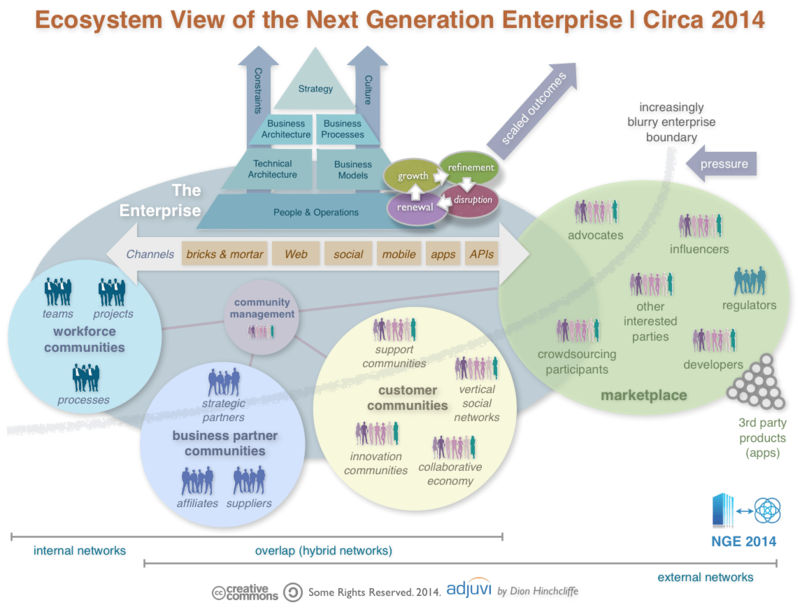 These new enterprises have shifted from traditional 19th century top down organization structures to networked communities of employees, partners and customers all working together to create value. So can Microsoft’s venerable technologies such as SharePoint, Dynamics, .NET, Windows and Office be transformed into a platform that supports businesses ambitious plans to harness cloud, mobile, and data into next generation enterprises? This is the mission that Satya Nadella’s has established in his short tenure at the top…looking forward to see whether this can be delivered and as a Microsoft partner our mission is to help businesses harness these new platforms to deliver innovative new ways to disrupt the market.